Dead in Bermuda is a great little game that I loved playing, learning and eventually mastering. A combination between Lost and Survivor with a bit of a casual/time management touch, Dead in Bermuda puts you in charge of a group of survivors who have to find a way to survive on an isolated island after their plane crashes. 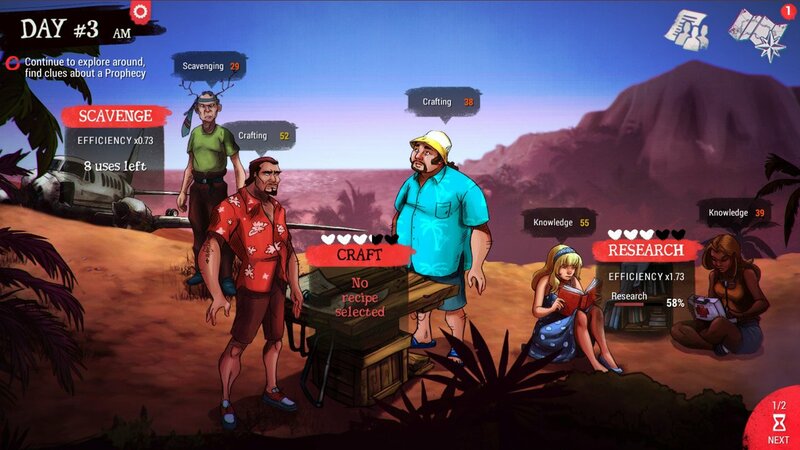 Although the game looks a bit casual, as I said, it is actually pretty deep and extremely difficult to complete – but I am here to help you achieve that by sharing with you some Dead in Bermuda tips and tricks for a complete strategy guide to beat the game and bring all the survivors home. Which won’t be easy! 1. Focus on research and crafting early on: make sure that you have the best people doing the research at all times (best research, which are the young girl and the old survivor guy, also the doctor can be used there) and the crafting (the Russian guy rocks there!). Try to have the fishing rod as fast as possible – it’s doable in about 2 weeks, and once you have the fishing rod, things start to get a bit easier since food will no longer be a huge problem. 2. Don’t spend too much time with the plane. Even though it seems that the quality of food you find in the plane drops the more time you wait, there’s no sense in scavenging the plane too much too early and have too much food that turns into Barely Edible stuff. Early on, the plane is the source for your food and only scavenge it when it is needed. 3. Always optimize the usage of food: if you have the best quality type of meal, it makes no sense to use it unless you have a character with a hunger meter equal to the maximum it can restore. Always start by using the best food (but only if your hunger is high enough) and then work your way down. Food quality can go down every night, so it makes a lot of sense to use your best food in order to get the maximum amount of hunger points restored. The barely edible stuff stays there for long enough to use it eventually, but restores very little! 4. Exploring is not vital at first. Unless you really have survivors that are well rested and can’t be used anywhere else, you should be exploring – otherwise wait a bit. There’s no rush to explore the island before you manage to set up food production and get enough water. You can indeed get some nice goodies from exploring, but usually the numbers are too low to actually make a difference at first – so make it your #1 priority to build up a solid base and keep everybody alive. 7. Once you can cook, stop eating raw food: this one’s a no brainer, but it has to be said. Optimize your time and fish/hunt during the morning, then cook your food or dry it during the evening. Not only that you will get better stats when recovering food, but you also avoid getting your survivors sick. 8. Always have resources to maintain your equipment – wood is extremely important here, so make sure you always have a stash of it just in case. You need wood for crafting, maintaining your items and for keeping the fire alive. It’s one of the most important resources, so make sure that you have at least a few items always available. 9. Characters that kill each other – this seems to be rather random and triggered by various events that you sometimes can’t control, but one thing is certain: if their love or hate meter is too high, then the chances of jumping to each other’s throats are bigger. So try to keep them balanced in order to have complete harmony in camp. But remember: even if one or a couple of characters die, it’s still possible for you to complete the game if you follow the tips above! Do you have other tips and tricks for fellows trying to complete Dead in Bermuda? Let us know by commenting below!